One of the contrasts between working in Kenya in the late 1990s and working with several Asian countries in the 2000s, is the rapid rate of change happening in Asia. 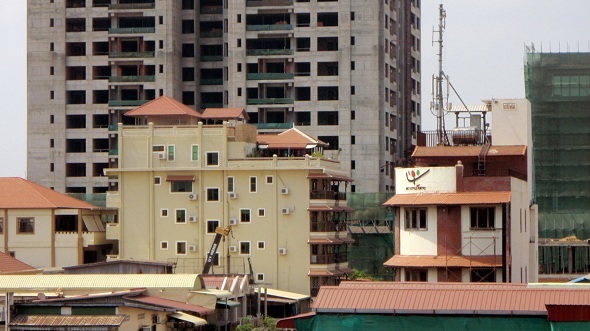 To be in Dhaka, Bangladesh or Phnom Penh, Cambodia—for example—is to be surrounded by construction and traffic. Within eye site of the hotel I stayed at in Phnom Penh there were at least 3 large buildings going up, accompanied by the dull, heavy thud-thud of cranes ramming pilings down into the soft subsoil in order to stabilize the high rise buildings. The demand for construction labor is changing the nature of community life in the country side as men migrate to the city for find cash-paying work—often driven by the need to free themselves from debts to money lenders. And, you see them working seven days a week—there ain’t no Sundays for them. The Cambodia Daily, an English newspaper, reported that in the year 2012 the banks in Cambodia gave out 30% more in loan funds than they did in 2011. Maybe it’s no surprise that the streets are full of new-used Lexus vehicles, that there is a construction boom, and people are migrating to the jobs. But, having lived through the “bust” of the USA economy, and having read in the same newspaper that 55% of the land in Cambodia has been sold to investors, both foreign and domestic—-I have to doubt the health of this boom for the people of Cambodia. I hope my doubts prove untrue.